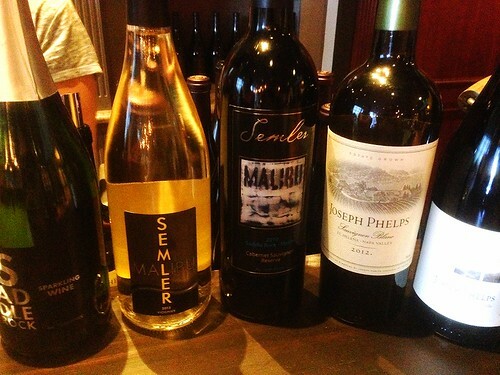 During my time there, they were featuring one of Napa Valley’s finest, Joseph Phelps. And yes, Phelp’s 2011 Sauvignon Blanc is probably one of best wines I’ve had – high acidity, tingly, off-dry but bursting in citrus flavor and gentle spicy finish – think about it like a high end Burgundy without the high price. I also enjoyed Semler’s 2010 Cabernet Sauvignon Reserve – full bodied with hints of black cherries and nice peppery finish. Felt very light at the beginning but the strong tannin and acidity lingered on my tongue for quite some time – very delightful when I was noshing the small bites: shrimp pesto flatbread, mushroom pizza, and grilled meat skewer. As far as concept, I thought The Tasting Room was cleverly built around the idea of approachability, sans the snobbery and the typical cheese/ charcuterie board pairing; instead you get sweet chocolate bark, smoky pork rillettes, and salty olives/ nuts. 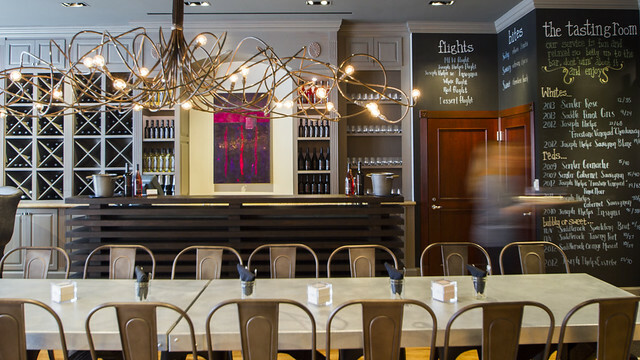 Service was impeccable – servers were attentive while wine reps were very passionate to educate. Also, love the rustic interior here. The room has a vintage-cabin-in-the woods feel to it, albeit with a swanky psychedelic chandelier, a stainless steel pizza oven, and over the top balcony view of the botanical garden. 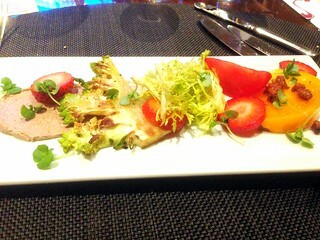 The tomato salad was a great beginning – light, refreshing, sweet and a tad peppery. What struck me with this dish were the variety of vegetables, fruits, herbs and accents in the salad. The sweetness from the tomato and strawberry was tempered lightly with the spicy/ bitter quality of the basil and chicory. I thought romanesco was the star here, not only because we don’t get enough of this broccoli hybrid; it was cooked tender enough to give a good crunch and an earthy nuance. I thoroughly enjoyed the Hamachi – slightly salty, slightly fatty, and wonderfully rare. I thought the addition of smoked garden beets and heart of palm was very progressive. The heart of palm had artichoke quality – nutty, tender, and velvety in texture. 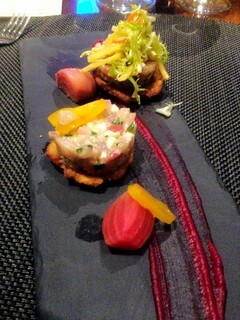 Smoked beets were interesting here – I thought the sweetness got intensified with the smoking process. All in all, this dish is a perfect orchestra of savory, sweet, smoke, and butyraceous, all while the plantain packed a nice crunch. 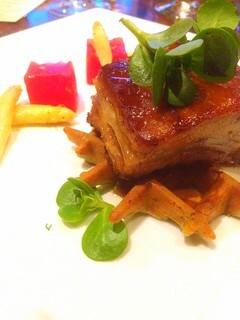 Pork Belly with White Asparagus, Coriander Waffle, Compressed Melon, Smoked Maple Gastrique. I pretty much inhaled this. It’s not good, it’s greaaaaattt! Just what I expected, the slow braised belly was oozing fatty goodness, juicy, gelatinous, pleasantly filling, and broke apart upon first bite. Flavor wise, it definitely highlights the best of Southeast Asian Flavors and Soul Food. The savory/ peppery belly paired almost perfectly with the zippy watermelon and sweet/tangy quality of the maple gastrique. I definitely appreciate the inclusion of coriander waffle – it’s forward-thinking and it’s something I never had. But the waffle fell short for me; it felt dense and lacked sugary sweetness. 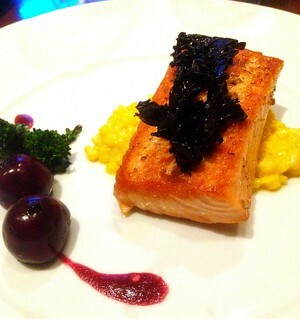 The salmon was cooked to a pleasantly rare temperature to highlight the fish’s fatty, luscious qualities. It’s dreamy softness. Reading the menu, I was leery that the dish would be overly sweet due to the corn and cherry. However, the addition of earthy mushroom and semi bitter rapini made the entire dish an interesting interplay of savory, sweet, sour, and smoky. Chocolate cake was surprisingly dense and heavy, though the flavor skewed on a bitter side. I thought the roasted fig ice cream was crucial here, not only it lightened the cake texture, but also because it added honey-like sweetness and wonderful aroma. 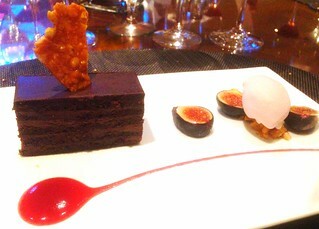 Not sure what to think of the hazelnut brittle - it felt like a garnish and I didn't care much for it. And with that, I can honestly say that I was quite impressed with the Four Seasons. The food, which could easily be overdone, surprisingly well thought and integrated, everything was very good from finger foods at The Tasting Room to dinner at The Lobby Lounge. The wine program is probably the best in the area and the education was first class. But perhaps what impressed me the most was the wonderful staff. Unlike most trendy boutique places I stayed, there was a genuine feeling of welcome, warmth and friendliness from everyone I encountered. Can’t wait to do this all over again.